One of the most common questions we see asked in social media drone groups is what rules apply to carrying drones and lithium (Li-Po) batteries on board airliners. In general, airlines are not too concerns about the carriage of your drone, it’s more the batteries that can cause problems. If lithium batteries are mishandled, mislabelled, dropped, or carried incorrectly, they can have serious consequences for aviation safety, such as an uncontrollable fire. The fire suppression systems currently in airliner cargo holds may not adequately suppress a fire involving lithium batteries. There have already been occurrences where lithium battery fires have destroyed an airliner. In this blog, we discuss the rules for travelling with lithium batteries. The following is a quick overview, and we’ll provide a more detailed explanation later in the blog. Drones can usually be transported as carry on (depending on the size) or checked luggage. A battery may be inserted in your drone (which counts as an electronic device), but your need to follow precautions to ensure the drone doesn’t turn on in flight. Spare (i.e. loose and not inserted in the drone) lithium batteries must always be transported as carry-on luggage only and never checked-in. For most consumer-grade drone spare batteries (such as Phantom or Mavic batteries with a rating no more than 100Wh), you can generally carry as many batteries as you like in your carry on luggage. However, Qantas Group airlines now have a 20 battery limit. In addition, you’ll probably hit your 7kg carry-on weight limit before your battery limit! Lithium batteries are made to deliver a high output with minimal weight. Battery components are designed to be lightweight, resulting in thin partitions between cells and a thin outer covering. The partitions or coating are fragile and can be punctured. If the battery is damaged, a short occurs, and this spark can ignite the highly reactive lithium. Another threat is that the battery can heat to the point of thermal runaway. In this case, the heat of the contents exerts pressure on the battery, potentially producing an explosion. The current ICAO rules state that a passenger may carry a ‘reasonable amount’ of lithium-ion batteries, ‘for personal use’, with a rating of not more than 100 Wh (watt-hour), or lithium metal batteries with up to 2g lithium content (most RPA batteries are lithium-ion, therefore the Wh limit will be the restriction). In addition to the ICAO rules, each airline may have supplementary policies in relation to the carriage of lithium batteries. It is the responsibility of all airline passengers to ensure that they comply with the airline requirements, including any written approvals, before taking lithium batteries on a flight. These policies are usually found on the airline’s website. The Qantas Group introduced a supplementary policy in 2018, which restricts passengers from bringing more than 20 batteries onboard in their carry-on luggage. Table 2.3A of the Dangerous Goods Regulations provides guidance for carrying DGs, including lithium batteries, in carry-on or checked baggage. You can download a copy of the table from this website. Under 100 Wh – Lithium batteries installed in portable electronic devices may be carried in checked baggage or carry-on baggage. Spare batteries may only be taken in carry-on baggage and must be properly packaged, with the terminals isolated. 100 to 160 Wh – Passengers wanting to carry batteries between 100 and 160 Wh, fitted in a device, or as spares, must comply with the policy of the airline with which they are travelling. Most airlines require approval – it is recommended you contact the airline prior to travel. Only two spare batteries between 100 and 160 Wh are permitted per passenger, properly packaged, in carry-on baggage. If passengers wish to carry more than two spare batteries rated between 100 and 160 Wh they must be consigned as cargo (where permitted by airline policy). Over 160 Wh – All batteries rated above 160 Wh must be consigned as cargo. They are not permitted on passenger aeroplanes in either carry-on or checked baggage. They will travel on specialised freight aircraft. The device must be protected against inadvertent activation – e.g. an on/off switch that is suitably protected and cannot be accidentally turned on. Batteries > 160Wh are not permitted and must be sent as freight and declared as a DG i.e. by using a freight company such as Toll or TNT. Qantas Group airlines (Qantas, QantasLink, Jetstar, Network Aviation) – no more than 20 spare batteries per person. 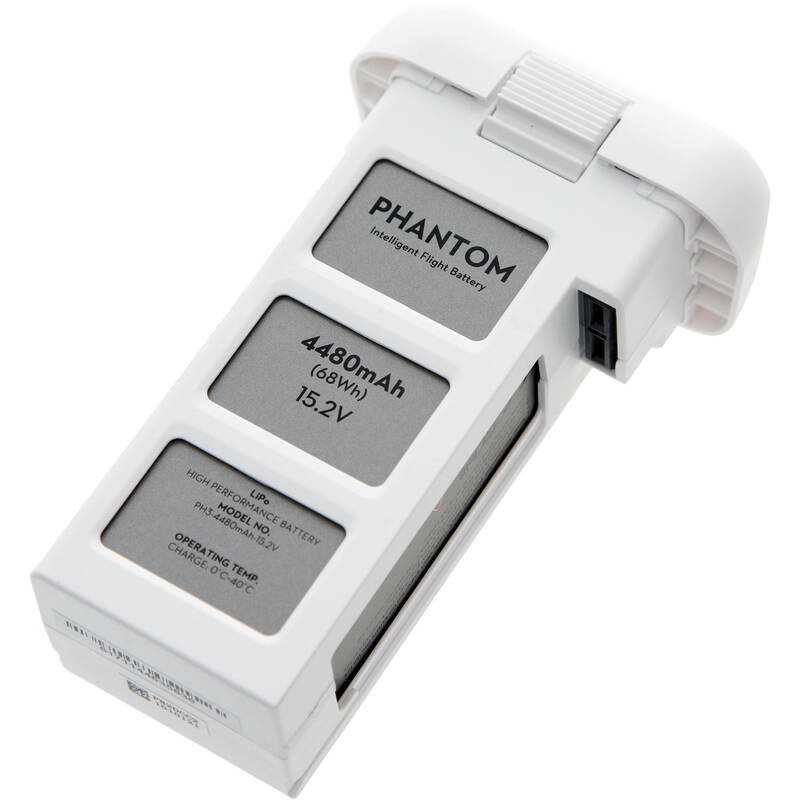 Most modern batteries have the watt-hour rating (Wh) already displayed on their casing, making it easy for travellers to determine how powerful they are (see Phantom 3 battery to left – 68Wh is marked). Some batteries, particularly older models, might not have their watt-hour rating readily displayed. They should, however, display the voltage and amp hour, which will make calculating the watt-hour simple. To calculate your battery’s watt-hour rating, you simply multiply the Voltage (V) by the Amp hour (Ah). For example: a 12 Volt battery with a 5 Amp hour rating will be 60 Watt-hours. If the battery is rated in milli-Amp hours (mAh)—then divide your final answer by 1000 to arrive at the Watt-hours. Hiding lithium batteries in checked-in baggage means you are not declaring dangerous goods. There are severe civil and criminal penalties for not declaring dangerous goods, particularly if there is an accident or incident. For certified RPA operators, penalties may include administrative action, leading to the cancellation of CASA operating certificates or approvals. CASA and the airlines have worked with the Australian Federal Police and the Commonwealth Director of Public Prosecutions in the past to ensure that individuals responsible for breaches are prosecuted. Criminal penalties include fines of up to $71,400 for individuals and $357,000 for corporations, and a maximum of 7 years imprisonment. Obtaining the approval of your airline. If you are seeking additional information, please visit the CASA Dangerous Goods website or contact your airline.